Art Licensing: Are Paper Products Being Replaced by the Internet and Smart Devices? Because of the Internet and increasing usage of electronic smart devices' it has been long predicted that we are becoming a paperless society. But according to the article "Paperless society? Not so fast" even though electronic technology has taken a toll on the pulp and paper industries especially in the production of newsprint there are still 20,000 identifiable uses of paper in the world today. To stay in existence many print companies that in the past used paper products exclusively are now hedging their bets by also moving to the Internet and offering electronic versions of their publications. According to IDC (International Data Corporation) in the article "Paperless society? IDC says not so fast" although the world is printing less, "the paperless society remains largely a myth as page volume from printers was 2.98 trillion 2012, down 1.5 percent from 3.03 trillion in 2011". It will take a long time IF ever before we become a paperless society. So what impact has the surge in use of the Internet and smart devices have on the art licensing industry? Paper products such as greeting cards, wall calendars, personal checks, and daily planners are now competing with electronic technology. And, these paper products use licensable art to help sell them. Will these industries disappear along with the opportunity to license art for them? The sales of daily planners are declining as smart devices take over the task of scheduling persons daily lives. But according to the article "Daily planners: paper or electronic?" many people are visual and although electronic planners make life easier it still is satisfying to write down lists, scratch them off when complete, and know that it is crash proof and will not suddenly disappear. According to the article there still is a large segment of the population that use paper planners. This industry probably will not disappear but to stay in business it now has customizable features and is more for a niche market. One of the biggest industries that depend upon art and photographs to sell products is wall calendars. For years it has been a tradition in December to purchase calendars for the kitchen, maybe for other rooms in the home, and for gifts. 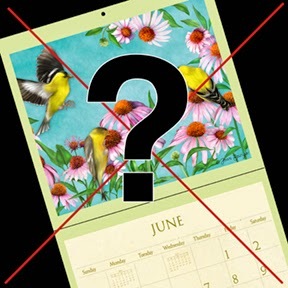 Now smart phones and computers have taken over part of the calendar industry but do NOT think wall calendars will disappear. According to the article "Calendars: The Paper-Digital Trap" it seems that many people are using both paper and electronic calendars. Individuals use electronic calendars as daily planners while person(s) use wall calendars as wall décor and scheduled appointments that can be viewed at a glance. In the article " Why do we still buy calendars?" Dr. Paul Glennie at the University of Bristol in the UK thinks that ". . . the calendar has a social function, bringing people together around a common focal point. . . From a household point of view or a work point of view, it works on a more obviously collective level than everybody looking down at their own apps." So, it looks like calendars are here to stay. But because of the shift in consumer spending, consumers now wait for the expected discounted calendars to go on sale before purchasing them. This is affecting the amount of revenue that calendar manufacturers make and thus the amount of royalties paid to artists. Now that bills can be paid online you would think that the use of checks are now obsolete. But according to the articles "Why don't more consumers use automatic bill pay?" and "Are Paper Checks Still Useful" only 50% people pay their bills online. The reason is not all persons find it convenient, have computers, or trust the security of paying over the Internet. Also not all companies are set up for their customers to pay online. And, checks may be the only way to pay services such as the hairdresser, gardener, house keeper, or send money gifts to friends and relatives. Decorative personal checks are a favorite among those that like to express their personality as stated in "Five Reasons Why You Should Still Use Personal Checks" and it is also easier to keep track of personal finances. But because of the ability to pay bills online, checks usage has declined. Thus, the personal check industry has weakened resulting in artists not making much revenue for licensing their art on them. About five years ago when e-cards became popular the paper greeting card industry were concerned that they would be put out of business because consumers would only use e-cards. The reason is that e-cards are either free or less expensive than paper cards and do not need the additional cost of a stamp to send it. American Greetings and other large card companies struggled as revealed in the article "Even As American Greetings Struggles, Small Card Companies Find A new Way to Thrive". However, small card companies found a way to successfully sell cards by producing a handmade luxurious look with embellishments and die cuts that e-cards could not produce. These cards became so popular that now the large card companies have also included embellished cards in their card lines to satisfy customers seeking elegant looking cards. Selling products during the Christmas season is huge and that includes Christmas cards. In the article "E-cards an alternative, not replacement to paper Christmas greetings" it states that "Although many people use e-cards because they're free, convenient and eco-friendly, it's unlikely that e-cards will replace paper Christmas cards entirely. That's because the tradition and the sentiment of sending greeting through the mail has been in place for centuries." That is good news for the art licensing industry because there are over 50 paper card manufacturers that license art. Read artist Kate Harper's article "Artist & Writer Submission Guidelines for Card Companies" for a list and links for manufacturer websites. There is no question that there is a weakening of sales over the last five or so years for many paper product industries with the usage of the Internet and smart devices. It has impacted the art licensing industry as licensing revenue for products that license art has decreased. However, it is not entirely due to the increase usage of the Internet and smart devices but also because of the downturn in economy and change in consumer spreading*. To paraphrase Vice President Susan January of Leanin' Tree, Inc. (greeting card manufacturer) at a 2013 SURTEX show seminar "Artists use to be able to make a living in creating greeting cards but not anymore. Artists often need alternative means of revenue." Note: The invention of electronic devices have created more products to license art such as skins and cases for cell phones, tablets and computers by manufacturers such as keka and Gelaskins. But, most of these types of companies are Internet stores and offer licensing print-on-demand deals or buy the designs outright. Thus, the revenue is not that lucrative. * The impact of the great recession on consumer spending has created a new norm of bargain hunting. Consumers are looking for discounts and expect it from retailers. And, they are not splurging as much as they did before the recession and normally only buy what they need. It is predicted that this change in consumer spending will NOT shift back to pre 2008 spending. Art Licensing: How do Artists Create Art for Products? This article is mainly for those artists new to licensing. But, there may be a tidbit or two that will also be useful to seasoned licensed artists. There are many ways to create art to be licensed for products. 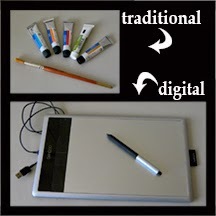 Some artists create art the traditional method with paint, some create digitally with computer software, and some create art with a combination of paint, digital text, and backgrounds. But no matter what method is used, the art needs to end up in a digital format because that is required by the majority of manufacturers that license art. So it is imperative that artists either know how to use a computer or hire someone that does. Note: The most used computer software in the art licensing industry is Adobe Photoshop for painterly looking images and Adobe Illustrator for patterns and illustrative looking images. Read, "What is the Difference between Photoshop and Illustrator" to learn more about the software. Before you start creating art to license, you need to understand the licensing industry. Painting images in an art style, format and themes you like is not always licensable to be put on products for the mass market. Manufacturers license art with images that are popular with many people so their products sell well. Until you know the popular images and the way it should be formatted for each type of manufacturer you could be wasting your time trying to license it. Read the following articles for more information. • "Editorial: Not all art is licensable"
• "Art Licensing Editorial: List of 2012 Trends" Many of these trends are still relevant. • "Photoshop Tip: Description of File Formats and When to Use Them"
• "How to License Art to Manufacturers"
As mentioned above, manufacturers want digital files of the image. Thus, artists that create their art with paint need to either scan the image into the computer or photograph it. But, there can be complications with each method. If the painting is too large for the scanner the artist may need to scan the art by sections and combine the sections into one image while in Photoshop. Or if the painting is photographed, it may end up to be skewed looking if the lens of the camera is not perfectly parallel to the surface of the painting (parallax). Read "Art Licensing Tip: Converting Paintings into Digital Images" for more information on how to correct parallax and how to combine scanned images. Some manufacturers prefer that art be created with paint instead of digitally. But they expect much more editing of the image than just cropping parts of the it that was only possible years ago. Software like Photoshop can manipulate parts of the image in an amazing number of ways. In Photoshop parts of the image can be isolated and moved, removed and the color changed. 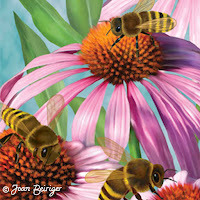 Hint: Many traditional artists are now painting individual icons (flowers, birds, butterflies, sea shells, etc.) separately on a white background instead of sketching and painting the image as a finished composition. They then scan the painted icons and a separate painted background into the computer. In Photoshop the icons and background are placed into individual layers and the white area around the icons is removed. The icons then can be arranged into a pleasing composition. The advantage to having the icons on separate layers is they can be easily moved and edited as well as used in other paintings. Once the technique in creating art digitally is mastered, it is faster than the traditional method. Digital art can be created on the fly and easily altered. And, images on separate layers in the software can be easily moved so that the art is not locked into a single composition. As an alternative to using a mouse, many digital artists use a graphics tablet and pressure sensitive pen (stylus) to create art. With the pen they can easily draw freehand and control the line thickness, transparency and color by exerting pressure on the tablet with the pen. Adobe Photoshop, Adobe Illustrator, Corel Painter and many other art creation software support pressure sensitive pens with tablets. Note: A disadvantage to creating art digitally is that some manufacturers still resist licensing digital art under the mistaken notion that the art will look computer generated when placed on products. Of course, that is no longer true because of the advance in technology. Some artists’ use a combination of painted icons and digital backgrounds, digital text and copyright free digital clip art to embellish the art. Hint: Always place individual icons, backgrounds, etc. in layers whenever possible. Manufacturers sometimes request layered Photoshop files so that they can edit the art. After the art is created, the real work begins by submitting it to manufacturers. Articles about different product industries including links to their websites can be found on my blog.